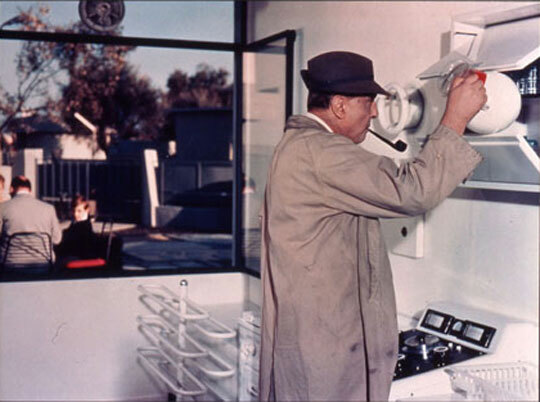 Mon Oncle – Jacques Tati (1958), BFI. Of all of Jacques Tati’s films, Mon Oncle (1958) is probably the most disarming in its satirical attack on efficiency and modernity. Monsieur Hulot is the perfect out of place character, stuck in an ever changing world that values tidiness and its objects more than its happiness and relationships. The high tech nature that is gradually engulfing Paris has never been so quaintly photographed (though Tati’s Playtime (1967) comes a close second, though the city is completely modernised there). 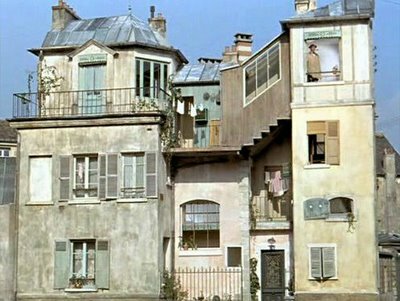 Hulot lives in a labyrinth of a building; a mismatched patchwork of architecture full of beauty and individual character. Mon Oncle uses its buildings and its architecture to show the differences between its characters and their value systems, perhaps more so than any film about class and the outsider. Hulot’s house requires him to navigate its winding staircases to get to his apartment, shown in a beautifully cut shot where the viewer is given little snippets of where he’s at in the building through its various gaps and windows. The family Hulot visits live in an entirely different building. Theirs is an ugly and cold block of building, built on order and regularity. The garden is a particular point of discourse with its unnecessarily winding path being strictly followed to get to the main gate, acting as a brilliant contrast to Hulot’s journey up to his top floor flat; a journey lengthened by choice rather than by necessity. Hulot’s increasingly chaotic visits to the modern house are cause for much amusement, with his inability to adapt to modern technology being something humours and highly sympathetic. The family’s house bears little difference with the husband’s place of work in a plastics factory; grey walls and electronic excesses. Hulot’s presence is mirrored by the children of the area who take full advantage of their parent’s obsession with their perfect scenarios and objects. One scene in particular where the children deliberately rock people’s cars making them believe the car behind has hit them is a perfect example of this. Not only do the drivers act completely unreasonably in the face of what seems an accident, Hulot himself causes a similar accident by chance, perhaps suggesting that there is hope in the future of the young who may not be so obsessed with a well ordered society after all. 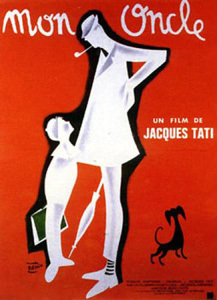 Tati is a master of orchestrating chaos in the most mundane of places and Mon Oncle has some of the best set pieces in comedy. The gradual decent into utter madness at a simple “garden” party thrown by the family is packed to the brim with visual gags, with everyone desperate to appear in a socially positive light at any cost. Hulot himself accidently sabotages the water feature (something which is only turned on when guests are at the house anyway) leading to all sorts of hilarious consequences. The funniest parts of the film are in the smaller moments surrounding Hulot’s head on confrontations with modern technology. When he finds a beaker that appears to able to bounce and is unbreakable, only he would assume that the rest of the household items are just as infallible. He even seems like a bad influence on his nephew, giving him all sorts of nick knacks to disrupt the peace and harmony of the quiet modern utopia such as a silly whistle and a paper clown. The BFI release of the film not only contains the original cut but also the overseas version with an English dub, extra scenes and even different signs in English. In a financial sense it’s an understandable marketing idea but even with Tati’s hatred of subtitles on record, it seems little more than sales boost. However the film is of such a high quality that it’s hard not to forgive the obvious reasons for making such a cut when this was only his third feature film after all. Also included is the original trailer (at least on the DVD version) and an excellent booklet of notes on the film. It seems fitting that Tati’s films are getting full restorations and improved transfers in our modern age where speed is key. There is an irony in there somewhere but Tati’s gentle prods at the absurdity of modern technology and its perceived importance in everyday life have never been more relevant than today; an age where gadgets such as Ipods and Iphones are essential to life though not necessarily to living it to the full. The Duel Format edition of Mon Oncle is released by the BFI on the 29th of October.